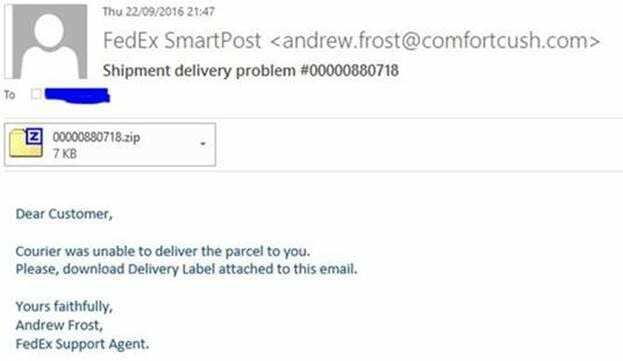 It has come to our attention there is currently an ‘Email Scam’ doing the rounds. WARNING the email contains malicious content. The email appears to come from ‘Fed Ex and sent with a .zip file attachment. DO NOT OPEN THIS because your machine will become infected. This is a variant of the Ransomware Cryptolocker. Should the attachment be opened, it may appear to not do anything. However, behind the scenes this will run a script that will encrypt all files/folders you have access to and demand payment to unlock them. Unsure whether an email is legitimate or not, please report this to Amshire Support on 0330 2020 340 in the first instance.